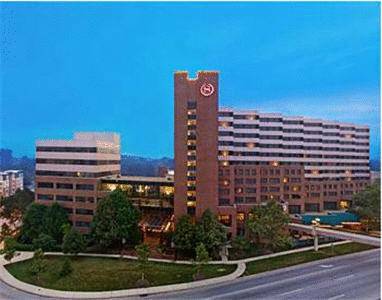 Ideally situated and brimming with home-like amenities, Sheraton Baltimore North Hotel is ready to elevate your Towson visit. Whether you're joining us for work or on a family vacation, we'll make you feel at home, with contemporary accommodations offering free Wi-Fi, flat-screen TVs and the Sheraton Signature Sleep Experience. Elsewhere at the hotel, you can break a sweat at the fitness center or take a refreshing dip in the indoor pool. We also offer an inviting on-site restaurant and lounge, as well as a cheerful coffee bar. Plan meetings and events for up to 800 guests in our versatile venues, which include three strikingly designed ballrooms. If you're in the mood to explore, you'll find our hotel perfectly placed; take the walk to Towson Town Center and Goucher College or drive into downtown Baltimore, just 3 miles away. We also offer a complimentary shuttle within a five-mile radius, including to the Light Rail Station. We're looking forward to your stay at Sheraton Baltimore North Hotel. Rain 903 All American Fair: Our signature restaurant serves modern American cuisine in a light-filled atmosphere. Fuel up for a busy day in Towson with a hearty breakfast or stop by for a meal or a drink from the bar in the evening. Coffee Corner: Jump-start your morning with Starbucks Coffee and assorted pastries at this convenient eatery, which also offers salads and sandwiches. It's the perfect destination for those on the go in Towson.